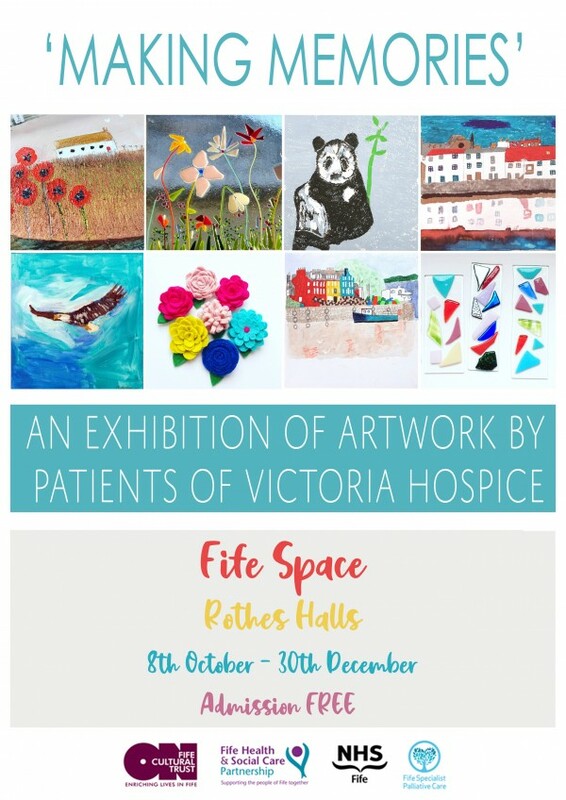 ‘Making Memories’ - An exhibition of artwork by the day patients of Victoria Hospice, Kirkcaldy From October 8th – December 30th FifeSpace Gallery at Rothes Halls will present the public with a rare opportunity to view a selection of inspiring artworks created at Victoria Hospice, Kirkcaldy. The ‘Making Memories’ art exhibition will showcase the talents of patients attending the day hospice and will feature a varied collection of creative works including fused glass, paintings, textiles, mixed media and printmaking. Victoria Hospice provides specialist palliative care to those in Fife with cancer and other life limiting illnesses, and the art on show has been produced during the creative, therapeutic art sessions offered as a part of the Day Hospice care. These art sessions form an important part of the Day Hospice service, providing an opportunity for the patients to engage and focus on new skills in a social setting, helping boost patients’ confidence and self-esteem.